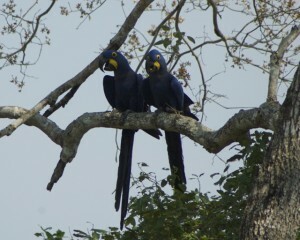 A pair of wild hyacinth macaws showing stressed body language that indicated they were about to fly off. 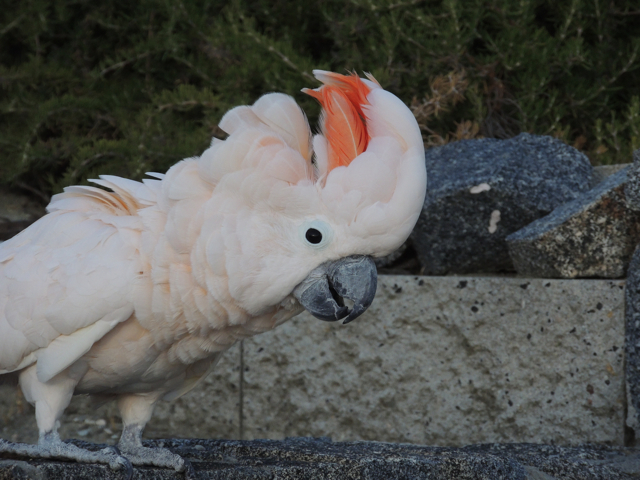 Building relationships with parrots that show extremely fearful behavior can be a challenging problem. 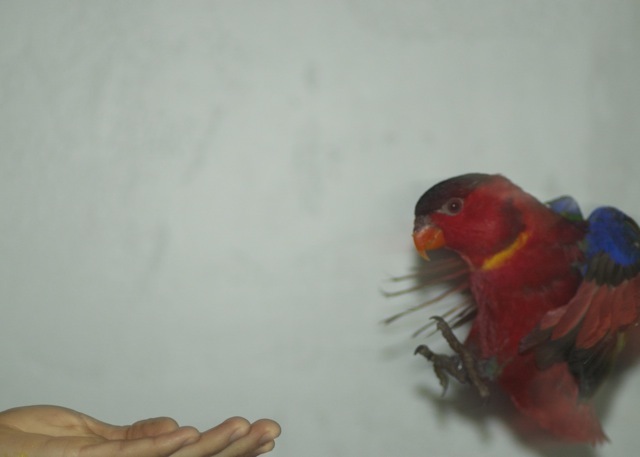 Much of the information that has been traditionally available is based on the one-way transmission of a singular goal: we want the bird to behave a certain way in our presence. As humans, this is strongly rooted in the way that we treat animals and often, other human beings around us: we often ignore the unspoken communication in the form of body language. By not recognizing this form of nonverbal language, we are simply having a one-sided conversation, forcing our goals upon the other party and teaching them that their “words” are ineffective. This manner of interfacing with our environment is so ingrained in our cultural paradigm that we don’t even realize that we are, in fact, using some form of force or coercion in order to get the other individual to perform the behavior that we desire. When I say that I that I don’t advocate the use of force when I train, most people hastily agree: of course not! Force breaks down trust-building pathways. 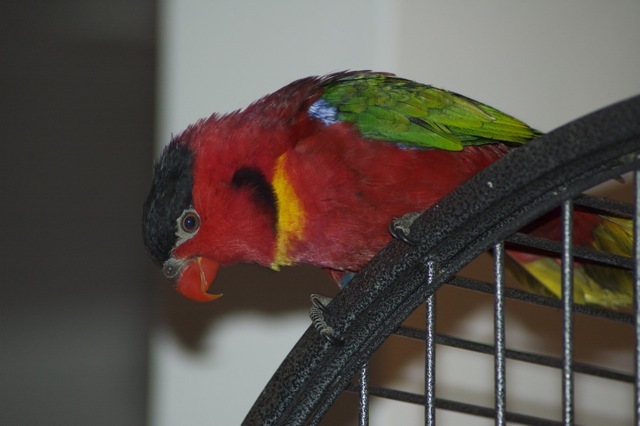 With that in mind, let’s consider a couple of commonly prescribed ideas for taming birds that exhibit fearful behaviors. 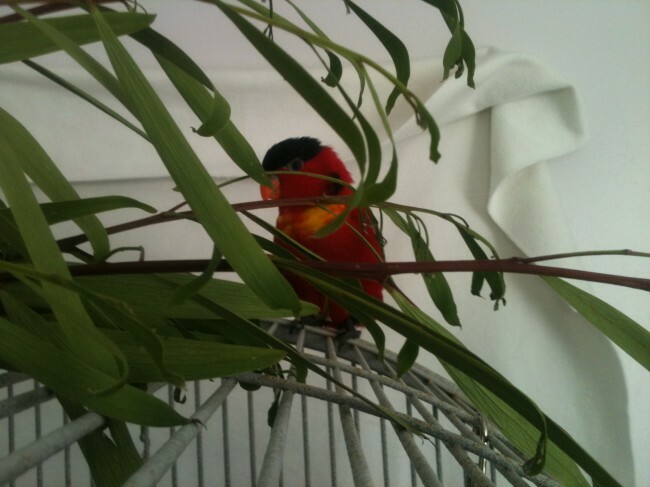 First, we have the idea of putting a chair next to the cage of a bird showing such behaviors in our presence, sitting in it, and calmly reading or talking to it until the bird finally calms down. Eventually, we might even take it further with Step #2 and slowly put our hand in the cage, wait for our bird to stop panicking before moving it closer in a stepwise fashion. understanding of what we just taught our little feathered friend. First, the presence of trust in a relationship is not solely based on the absence of physical harm. 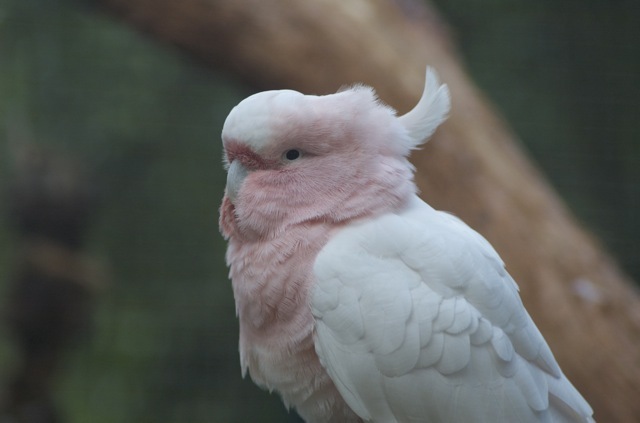 That said, it is very possible that if the bird were flying at the sides of the cage, he could have felt physical stress that could correlating to the presence of humans, even if that discomfort did not come our direct actions on the bird’s body. Further, when any animal reaches that stage of stress, we are changing the bird’s emotional state as well, involving a host of stress hormones that the bird will then not only associate with our presence, but these hormones also inhibit learning and rational thought as the bird focuses on survival, which means, essentially, fleeing and, in some cases, fighting. Whether the above-mentioned prescription for reducing fear in parrots caused our bird bodily harm is specific to each individual situation and not necessarily outwardly observable, as in the case with the bird’s resulting emotional state, hormones levels and so on. However, what we absolutely know is occurring and can observe is that while we are sitting in our chair or putting our hand in his cage waiting for the bird to calm down, we are blocking that bird’s responses: his body language, what he is trying to communicate to us. We are teaching him that no matter what he does, his behavior is ineffective: whether he shows fearful, trying-to-get-away behaviors or, in some cases, aggressive, backed-in-a-corner behaviors, nothing that bird does will get the human to leave. Response blocking, when done for long enough that the individual eventually gives up and stops behaving, is what brings about learned helplessness. This is the behavior we might mistake for true calmness and trust, but the two have very different – perhaps even diametrically opposite – emotional states, which lead to very different behavior pathways over the long run. An animal that has given up out of frustration will be much more likely to aggressive or escape/avoidance behaviors in other scenarios. These methods have been on the books for generations, and we still use them because they are what we have available. 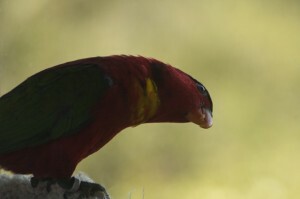 But we must start making a stronger case to understand the power of using two-way communication, not just because it brings us a stronger connection to our feathered companions in that feel-good, warm fuzzy way, but also because it establishes a way of interacting with our parrots that reduces behavior problems overall. When we allow our birds access to the powerful tool of communicating with us, you will be amazed at how clearly we can see what they are saying and how we can maintain high standards of behavior and make changes with relative speed when applied correctly. I deliberately set up his temporary digs to illicit as little fear response as possible: I made his food and water bowls really easy to access and close to the door to the room to change out, and I put throw rugs down around his cage so that I could drag them out of the way and replace them rather than sweep and vacuum around his cage t o clean that would no doubt lead to more cage bouncing. I stayed low and moved slowly. As I approached him, if he looked like he was about to take off in a panic, I stopped and let him relax. When he did, I actually rewarded him for showing the calm behavior by taking a step or two back. Then I would advance slowly and repeat the process as needed. It worked beautifully, and I am only had to do that for a day or two. Beans enjoyed the branches immediately! this to benefit us both and attach some acacia branches to his cage for privacy while he was a safe distance away, whereas that probably would have spooked him if he had been locked inside! He seemed to like the branches immediately. Then I fixed his favorite meal of nectar, put the bowl inside and waited until he went in and was committed to eating before I slowly walked over and shut the door. If I had felt the need to force him back in to the cage, I would have seriously derailed our progress! Day 6 saw huge success grow by leaps and bounds. 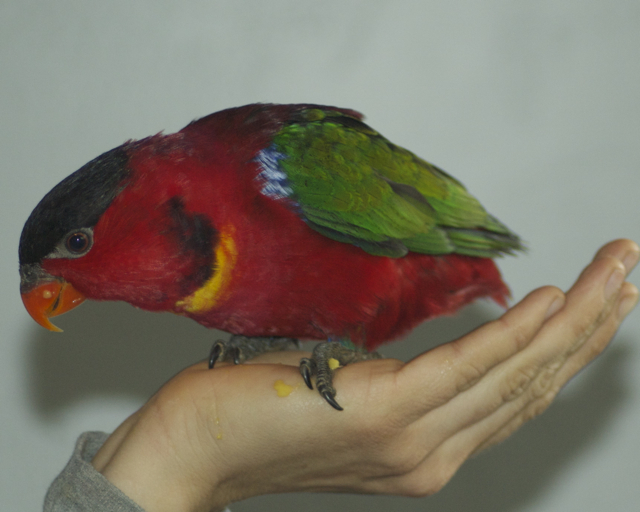 Once he started taking food from my hand, it was time to slowly start putting my free hand in the cage and asking him to come closer. This last video captures Beans slowly and deliberately stepping up on to my hand for the first time: Day 6: Training a Fearful Parrot – Beans steps up for the first time I was so excited but had to portray a calm exterior. Our relationship flourished from there. Using that foundation that we set together in the quarantine room, we built a friendship that continues to evolve and enrich us both. Today, Beans is rarely more than a hop away from me. He rides around with me as I do chores around the house. He talks non-stop, repeating everything Andre and I say, and he is an incredible chowhound that has learned to raid every cabinet and drawer for yummy things. We continue to train and communicate with each other. He is never slow to show me where the holes in my training programs are! We are still building our behavioral repertoire and learning new things every day. For a bird that thrashed around in his cage when he would see me, we have come so far. Many people are amazed that I was able to handle him so quickly, but it isn’t that surprising when we understand the principles I used. Beans was empowered to choose to be with me, not forced. I earned his trust by allowing his body language to change my behavior, and that, in turn, helped Beans feel comfortable changing his. There is nothing like positive reinforcement to demonstrate how limitless our relationships can be. Beans came to me a little red flash that I was aching to connect with. Now he is my constant companion and chatterbox that helps me connect others to success through science. 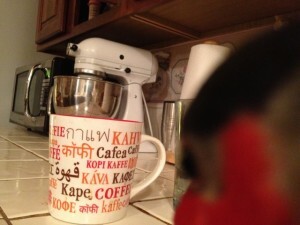 This entry was posted in Training and tagged Beans, Lory, Positive reinforcement, Scared birds, taming, training session. Bookmark the permalink.